Q: What are the dates for fish dinners in 2019? A. All Fridays during Lent – March 8, 15, 22, 29, April 5, 12 There is no dinner on Good Friday. Q: What time does the fish dinner occur? A: Meals are served from 3:30pm until 7:00pm or until we run out. We will try our best to have enough. Q: Do you cancel the Fish Dinner if the weather is bad? A: No – Rain, Snow, Blizzard we have prepared the food and it must be cooked. If the weather is really bad be sure to buy two dinners – one for today and one for tomorrow. Q. Can we get it to go? A. Yes, and you don’t even need to get out of your car. Drive-up take out service is available. Q: What comes with the meal? Q: What type of fish is it? A: All fried and baked fish is haddock. Adult servings are 8-10oz in size. Q: How many shrimp are in the shrimp dinner? A. Adult shrimp dinners come with approximately a ½ pound of fried shrimp (8 pieces). The child dinner comes with 5 pieces. Q: Do you have any gluten-free dinners? A: No. Sorry, but all dinners contain gluten. Q. Can I order ahead? Do I need tickets? A. There are no advance sales. If you are dining in tickets are purchased as the door. For drive-thru a volunteer will take your order right at your vehicle. A. Delivery is not available but we do offer drive-thru take out service. Just pull up and we will take your order and bring your meal out to your vehicle. Q: Where is Church of the Holy Family located? A: 3600 Phyllis St. Endwell. Q: Can I have the recipe for your Fish, Coleslaw, Macaroni and Cheese, etc? A: Sorry – that is a “Holy Family” secret. Q: How do I sign-up to volunteer? A: Sign-Ups are done weekly after Masses on the previous weekend. Sign-Ups are for workers at the dinners as well as people to bake dessert. Q: If I sign up to volunteer, what will I be doing? A: There are lots of activities to help with – from assisting in the kitchen, serving line, clearing tables and clean-up. The sign-up sheets are separated into different areas and times. We also have several “sit-down” tasks to be completed – like filling tartar sauce cups or wrapping silverware. Q: I heard I have to wear a hat if I volunteer – is this true? A: All workers in the kitchen and serving line need to have their hair covered. Workers clearing tables in the dining room do not need to wear a hat. We suggest bringing your own hat but we will have paper hats and hairnets available if you don’t have one or forget. Q: I would like to volunteer my time but I cannot be there on Friday afternoons. Are there other ways I can help? A: We have several other times for people to help throughout the week. Q: I signed up to volunteer but forgot what time I signed up for. 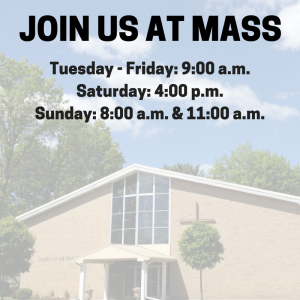 A: The parish office has a copy of the sign-up sheets. Sign up sheet copies are also posted weekly on the wall outside of the kitchen. Q: I didn’t sign up to work/bake but now I want to help. A: We can always use more volunteers and bakers. Call the parish office and let them know or just show up and we will find something for you to do. Q: I signed up to work but now I cannot make it on Friday. What should I do? A: It’s okay – we will find another volunteer to cover for you – but don’t forget to sign up for another week. Q. My question wasn’t answered here. Who can I contact?